Facilities maintenance is key to the success of every major business operation. Whether you own a warehouse for your logistics enterprise or a 24-hour supermarket in a busy locale, the care and clean up of the business’ structural elements, such as the floors, walls, and other similar components, should be among your priorities. This why you have to choose the best industrial sweepers and scrubbers from established companies like PowerBoss to ensure that cleaning jobs are done right. The following are some common factors to consider before investing in an industrial floor scrubber for your business. In terms of power source, business owners usually have to choose between battery-powered or electric industrial scrubber models. Of the two, battery-powered models are more flexible and can cover more space with less hitches. Personnel won’t have to worry about searching for an electrical outlet and ensuring that no one trips over the extension cord while they work. Battery-powered scrubbers, however, may be more expensive, require more maintenance, and have to be fully charged before being put to work. Then again, the benefits provided by battery-powered scrubbers far outweigh the initial investment and upkeep necessary. The lack of a power cord that can trip passersby or building employees is definitely among the safety features of battery-powered scrubbers. 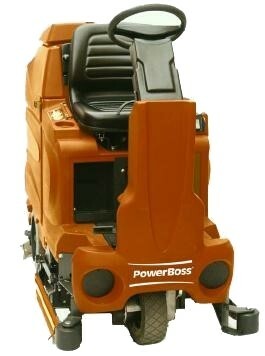 Other safety considerations when choosing floor scrubbers include excellent visibility wherein open operator compartments are preferable, superior cleaning and disinfecting capabilities to reduce the presence of harmful microorganisms in the immediate environment, and intuitive control panels for quick and easy management of the equipment, especially during emergencies. Lastly, riding floor scrubber machines should ideally have cushioned and adjustable seats for users, which reduces the occurrence of back pains and spinal injuries. Not all floor scrubbers are made equal so some will be more quiet than others–and you have to know when it’s better to invest in quieter machines. If your business calls for daytime cleaning while customers and employees are in the building, such as in schools or hospitals, floor scrubbers that don’t go beyond 70 decibels of sound are more suitable. On the other hand, if the floor maintenance of your facility can be done at night when there’s little to no foot traffic, minimal noise levels of the machine may not be a primary concern.